I mean that that is literally the most logical choice anyone could come up with, but not Candace. She tries to bust Phineas and Ferb by calling mom all the time and we all know how that always ends. Why just not to take a photo? Its not like her phone will be destroyed each episode. 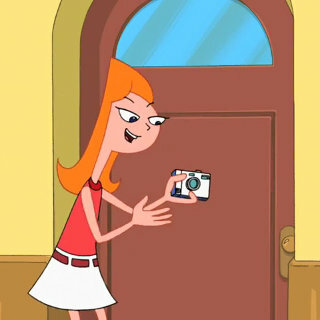 Candace has definitely tried several times to get photographic evidence, but it always fails. A photographer tries to get her to buy a souvenir photo and Candace realizes how to get evidence to show her mom. Grabbing the camera, she takes a picture of Phineas as he's driving, but doesn't have enough money to buy both photos. She gives one back, which the photographer rips up. She rides back home on her bike with the other photo. Back at the Garcia-Shapiro home, Candace presents the photo to her mom. It turns out to be the wrong one, the one the photographer took of her covered in racing-car gunk with Jeremy looking on in the background. Horrified, Candace lets out a loud and long scream. 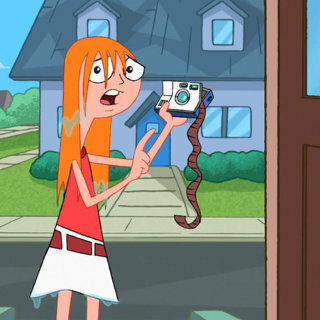 Candace attempts to show her the video on her camcorder, but Doofenshmirtz's Pop-up-inator shoots at the screen, preventing Linda from seeing the recording. Candace feels annoyed that always the same thing and it's like her life is a bad sitcom she walks across the living room, and sees an ad for a show called Bust Em!, which is a show that gets little brothers busted for the things they do. Candace calls the show to come to her house that she has a show for them. At the Bust Em! van, Candace asks if they got everything that they needed and Lulu shows that they got it, She tells Candace to call her mom for the big confrontation scene while she calls the station manager. Candace calls Linda who asks what took her so long and Candace says that she has to come home now and it's gonna be different this time, while Lulu calls the station manager that stating that this will be their best show they have. While Candace and Lulu run to the van, the station manager told Linda that he would not be getting use to that. She told him he will soon, however Lulu and Candace were both shocked that the Bust Em! van is gone. Doofenshmirtz stole the van and is happy that someone left the keys inside. 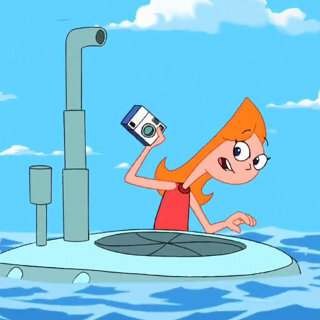 When Phineas and Ferb build a submarine, Cadence buys a disposable camera from a souvenir shop of the beach. She sneaks into the submarine without the boys' knowledge, and takes photos of their underwater adventures. But near the end of the episodes, when the boys are ready to return to the shore, Cadence fails to get into the submarine in time, so she has to swim to the shore while making sure the camera doesn't get wet. 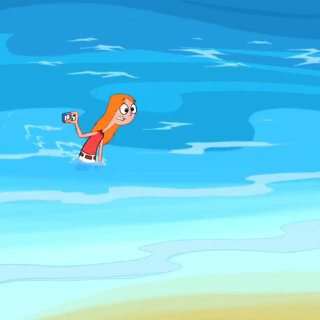 She manages to get to the shore, but the camera gets wet anyway right before she could show it to Mom, in a freak accident connected to Doctor Doofenschmirtz's invention of the day. A traffic camera DVD in the neighborhood gives Candace video proof of her brothers' activities, but Agent P is sent on a mission to destroy that DVD, because it has recorded his comings and goings as a secret agent. Perry realizes that he can't steal the disk this way without blowing his cover, and heads to Doofenshmirtz Evil Incorporated to borrow the giant robot, Norm. Norm opens the roof, takes the disk, and walks away. Her brothers say they'll get the disk back, even if she intends to bust them with the evidence. They chase him on their bikes, but Perry activates the afterburners, ditching them. Eventually, they come to a drawbridge, and Norm is caught in the middle as the bridge raises up. The rocket stops and Ferb jumps off and towards the robot, but is thrown off to the side. Phineas goes next, and quickly grabs the disk. He then jumps just as Norm falls into the river. The disk is teetering on the edge and Phineas is hanging onto an oily part of the bridge. Candace runs to help but is torn between the evidence and her brother. Ultimately, she saves Phineas, causing the disk to fall into the river. Phineas and Ferb build a full-sized boxing ring in the mall so Phineas and Buford can have a thumb wrestling match. Candace comes and takes a picture just as Buford gives Phineas's thumb a thorough beating. Candace races back to her mother with the photo and shows it to her, but her mom remains unimpressed, as all you can see of Phineas is the top of his head; the rest of the photo is covered by Candace's thumb. They start digging on a construction site, and Candace decides to record everything on her cellphone to show as evidence to her mom later. As Mitch tries to escape, Candace throws her cellphone to hit a button that closes the door that he is about to go through, trapping him but destroying the phone in the process. Candace tries to take a picture of the aquarium but everyone's fists are in the way, so she climbs up a tree and falls into the aquarium. Stacy comes over to the Flynn-Fletcher house to take care of Candace while she is sick. Stacy is sitting next to Candace who is in bed and Stacy talks about her exploits at the last hole ecstatically where Candace gets disappointed by her friend’s lack of control to get not seduced by the coolness and instead tells her friend to get evidence with a video phone. All of that was being sent from Stacy to Candace via video phone with Candace telling her that the footage was good but she needs to get the boys in the picture. Phineas finds Stacy and tells her they have been looking for her and that she needs to play through, so Stacy hands Phineas her phone and Candace notices Stacy not focusing and attacks her pillow. Why O.W.C.A. never recruits humans as agents?